If your IBM Watson Media account has been enabled with an Organization, you can assign your team administrators to manage the entire organization or only specific channels using the Administrator Permissions Feature. For more information about Organizations, please see the Organizational Level Management article. 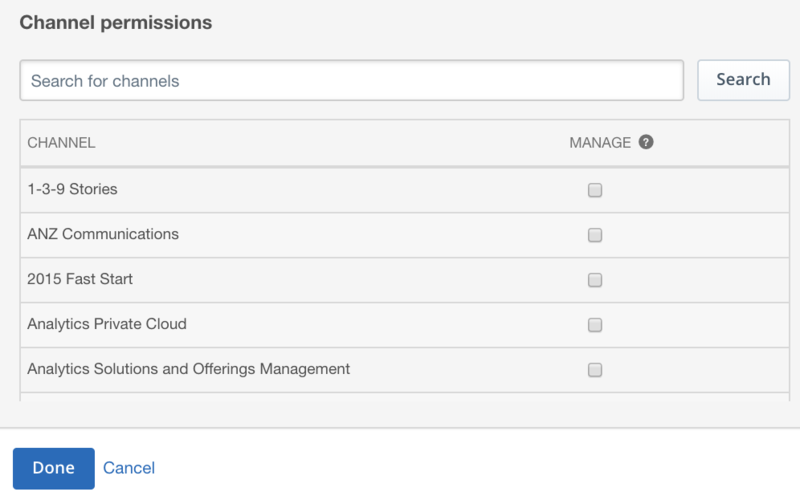 In order for your administrators to manage specific channels in your account, you’ll need to edit their permissions under the Organization settings page, found under your list of Organizations. Then click Manage next to Administrators. Then click the “Add people” and enter the company email address of the person you would like to manage specific channels. If you would like the person to manage everything in the organization (including settings, other administrators, accounts, channels and videos) select Organization administrator. 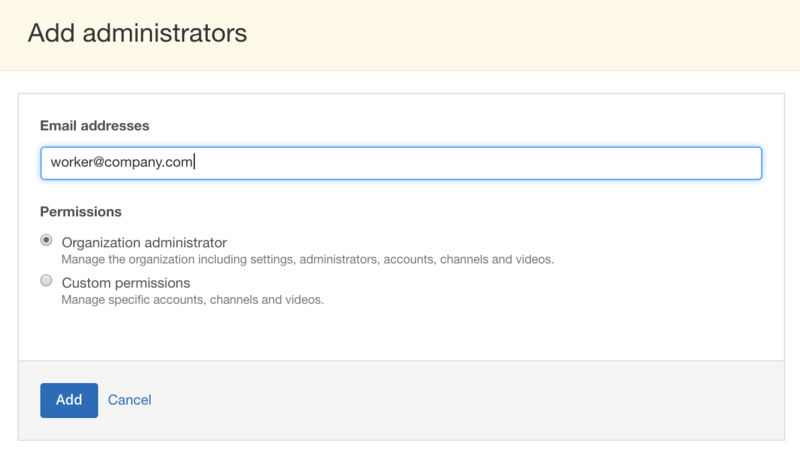 If you would like the person to manage only specific accounts, channels and videos, select Custom permissions. Then you will see all of the accounts found under this specific Organization. If there are multiple, you can select or deselect which accounts this user has access to. If you want to manage which specific channels this user has access to, uncheck the box. This will display all of the available channels under this account. 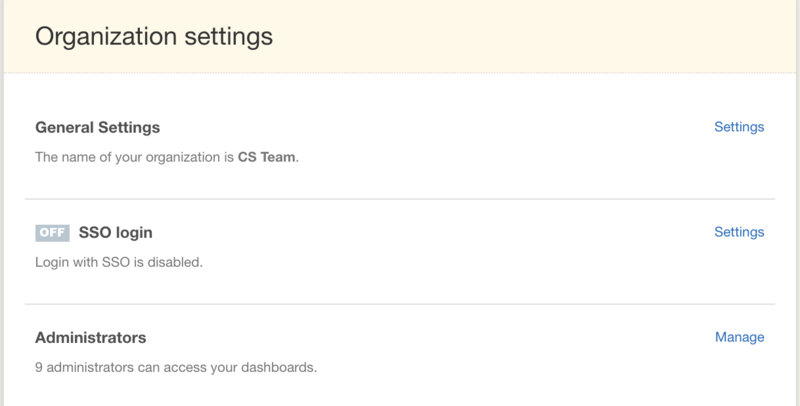 Selecting a box next to a channel will enable that user as an administrator for that channel. Once you’ve enabled the appropriate channels, press Done. Now when that specific administrator logs into their account at the ibmcloudvideo.ustream.tv login page, they will see the specific account they have access to. Under channels, they will only see the channels they have been provided access to. To log in, your new administrator will go to ibmcloudvideo.ustream.tv and either select “Log in with your IBMid” or “Log in with your company account”. This will depend on how your Organization SSO settings are configured. The administrator will select the appropriate Organization, and the appropriate account. Then, they will be able to select Channel, and see all of the channels they’ve been provided administrative access to. Note: If you are the original owner of this Organization, you will need to log in with your IBMid to gain access.